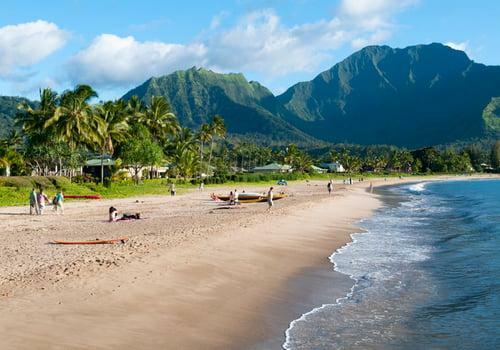 Take in the beauty all around you as you stand on the beach at Hanalei Bay. Slowly spin 360-degrees to see the surfers out on the waves, the families swimming in the calm waters near the shore, the towering mountains rife with waterfalls and the "autumn" mist that hangs in the air year-round on the humid north shore. This is truly one of Hawaii's gems. Look closely at the mountains and you'll see the shape of a sleeping dragon with the head resting on the western side of the beach. Some say that this shape is the inspiration for Puff the Magic Dragon, but, no matter how you see it, you can't help but be in awe of this mystical place. Driving to Hanalei Beach is half the fun. The Kuhio Highway slows down in Princeville as it begins to descend sharp switchbacks down the side of a mountain. You'll be shocked at Princeville's elevation as you descend back to sea level. 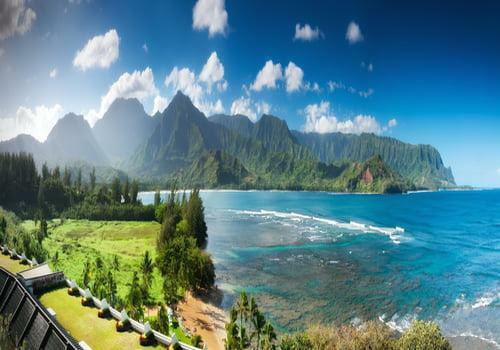 The switchbacks will give you stunning views of the entirety of Hanalei Bay and its beach. And right at the bottom of the mountain, you'll find the first of many north shore one-lane bridges. Once across the bridge, the road hugs a river that meanders through verdant fields before you arrive in tiny little Hanalei Town. Hanalei Beach is the kind of place you dreamt up before you even set foot on the islands, and the beach features something for everyone. The protective bay makes the swimming conditions here safer than most beaches on the island. The waters are usually calm near the beach, but, if there are waves, they are usually perfect for body surfing. However, all beaches on Kauai are subject to high surf and dangerous conditions during the winter months. Always use precaution, check the tide reports and ask a lifeguard if you have any questions. Farther out in the water, more than 200 yards out, you'll find surfers taking advantage of reliable waves. The good surfing can usually be found in the deep waters on the eastern side of the bay. If you've packed your surfboard, you'll see a handful of locals gathered near the spot. The two-mile-long beach features old-growth trees that can provide some shade. 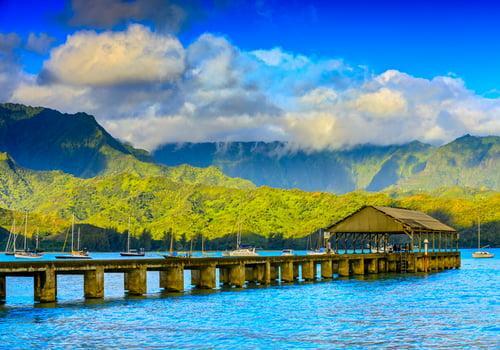 Most of the activity buzzes around one of Kauai's most iconic structures -- the Hanalei Bay Pier. At low tide, the pier can be exposed, but, at high tide, it's perfect for a relaxed afternoon of fishing. You might even find some kids jumping into the water off the concrete structure. Both the eastern and western ends of the beach feature coral reefs, but this is not one of Kauai's best snorkel spots. The edges of the bay are also more exposed to rough surf, so it's advisable to keep your activities to swimming, kayaking, surfing or lounging on the sand. And you're just steps from Hanalei Town at Hanalei Beach Park. The town features a variety of restaurants and some surprisingly high-end boutiques for such a remote location. Many celebrities own homes on the north shore of Kauai, so you might even spot a famous face or two. Parking is a bit tight. There are a few dirt parking lots mixed into a residential area just behind the beach. There are no defined parking spots inside the parking lots, so you might find yourself kind of winging it. Make sure to take precaution when you park your rental car as the ground is uneven. There are plenty of facilities at Hanalei Beach Park. You'll find barbeques, full bathroom facilities and picnic areas near the parking lots. Grab yourself a snack in town, head down to the beach, set up camp and enjoy the views. This is what Hawaii is all about. You haven't added any notebook. I want emails from Hawaiian Planner with travel and product information, promotions, advertisements, third-party offers, and surveys. I can unsubscribe any time using the unsubscribe link at the end of all emails.